Speaker at TEDx Khon Kaen, Khon Kaen, Thailand April 2018. WATCH HERE. 'Side by Side - Women Human Rights Defenders 2018' is a collaboration with Protection International and the Embassy of Canada to Thailand marking the occasion of International Women Human Rights Defenders Day. It will present large prints of 20 women human rights defenders. Exhibiting 35 images from the series FOR THOSE WHO DIED TRYING at Cultuurcentrum Mechelen. Exhibiting 35 images from the series FOR THOSE WHO DIED TRYING at Mahasarakham University, College of Politics and Governance. Exhibiting 35 images from the series FOR THOSE WHO DIED TRYING at the Learning Resources Center Khunying Long Athakravisunthorn – 3rd floor. An exhibition of 35 photographs, representing 37 fallen Thai environmental activists and human rights defenders, will be exhibited as one of the main highlight exhibitions which sees the exhibiting of photographic works around the city during the first half of February at THINK Park. An exhibition of 35 photographs, representing 37 fallen Thai environmental activists and human rights defenders, will be exhibited in Bangkok. Supported by Protection International and the Canadian Embassy and titled For Those Who Died Trying, this is the first time the exhibition will be shown in the country that it was produced - Thailand. For Those Who Died Trying will be exhibited for 2 weeks in collaboration with Protection International and Defenders in Dordrecht. Casa de la Juventud - Pamplona, Spain 17-23 October 2016 - An exhibition of 35 large photographs supported by Protection International titled For Those Who Died Trying at the Casa de la Juventud in Pamplona, Spain. The project looks to remember the Thai environmental activists and human rights defenders who were murdered whilst fighting to protect their communities. European Parliament - Brussels, Belgium 26-30 September 2016 - An exhibition of 35 large photographs supported by Protection International titled For Those Who Died Trying in Brussels, Belgium. The project looks to remember the Thai environmental activists and human rights defenders who were murdered whilst fighting to protect their communities. United Nations Palais des Nations – Geneva, Switzerland 9-11th May 2016 - An exhibition of 35 large photographs supported by Protection International titled For Those Who Died Trying in Geneva, Switzerland. The project looks to remember the Thai environmental activists and human rights defenders who were murdered whilst fighting to protect their communities. Bedgebury National Pinetum & Forest, Kent, UK April 2015 – September 2015 - A solo show of 30 large scale prints exhibited throughout Bedgebury Forest as part of my Atkins Ciwem Environmental Photographer of the Year Forestry Commission England Exhibition Award. The essay was about a forest community in Cambodia at risk from forced relocation following the proposal of a hydroelectric dam that would flood their homes. Grizedale National Park, Cumbria, UK November 2014 – March 2015 - A solo show of 30 large scale prints exhibited throughout the Grizedale Forest as part of my Atkins Ciwem Environmental Photographer of the Year Forestry Commission England Exhibition Award. The essay was about a forest community in Cambodia at risk from forced relocation following the proposal of a hydroelectric dam that would flood their homes. Angkor Photo Festival – Siem Reap, Cambodia December 2014 - Part of a group exhibition by Greenpeace International titled COALIFICATION OF WATER. The photographs of 8 Greenpeace photographers showing a journey through the lives of people who have been directly affected by coal power production and water scarcity. Angkor Photo Festival – Siem Reap, Cambodia December 2014 - A projection titled The Fight for the Areng Valley showing as part of The Impact Project, which showcases features stories about individuals, groups, or small organizations working to make a positive impact on social or environmental issues. Luke’s documentary was about a forest community in Cambodia at risk from forced relocation following the proposal of a hydro-electric dam that would flood their homes. Serindia Gallery, Bangkok, Thailand November 5-28th 2009 - Solo exhibition titled 'Tibet Outside Tibet - A photographers journey through Tibet's borderlands'. The gallery, owned by Serindia Publications, the Tibetan specialist book publisher, represents quality works of art related to the cultures of the Himalayas and Asia. 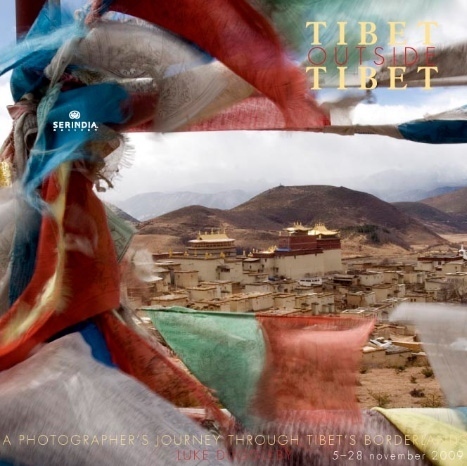 Trento Film Festival, Trento, Italy April 21 to May 3rd 2009 - An solo exhibition of 50 photographs from Eastern Tibet titled "The Invisible Side of Paradise" by Luke Duggleby will be exhibited at the 57th Trento Film Festival.